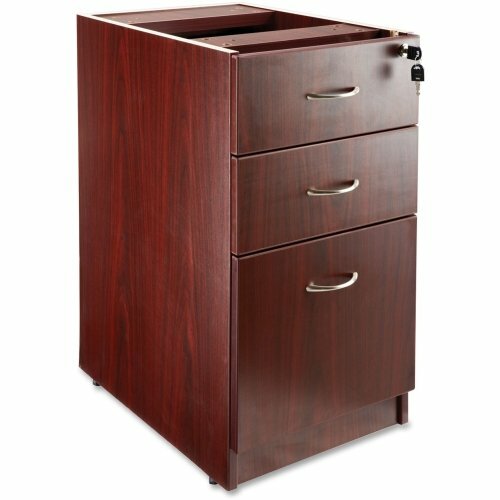 Hanging pedestal is part of Lorell Essentials Series Laminate Furniture with high-quality, Mahogany laminate construction. Pedestal offers a box/box/file design to store office supplies and important files. The file drawer includes hangrails and holds letter-size and legal-size hanging files. Design also includes 96mm metal drawer pulls with a silver brush finish and 3mm PVC edges. Pedestal attaches to the underside of the top of an Essentials Series desk, credenza or return with the included fasteners and extends to the floor. If you have any questions about this product by Lorell, contact us by completing and submitting the form below. If you are looking for a specif part number, please include it with your message.